As much as you may desire a bright, white smile, it doesn’t always happen naturally. Diet, lifestyle habits, and poor oral hygiene can cause your teeth to become yellow or stained. Brushing, flossing, and using mouthwash are often not enough to diminish stubborn stains. You’ll need to enlist the help of a professional to get the white smile you want. 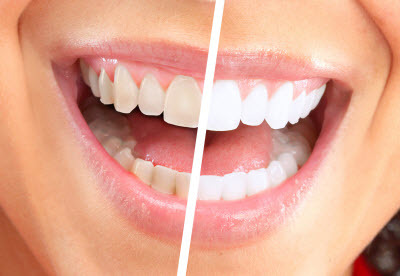 Professional teeth whitening is the most effective way to improve discoloration in your smile. Although over-the-counter methods can be effective for whitening the front six teeth, they’re hardly effective on whitening your entire smile. A professional teeth whitening can penetrate your entire dentition, ensuring comprehensive results. Zoom® Whitening is an in-office procedure that uses hydrogen-peroxide gel to lift stains from tooth enamel. During the treatment, the gel is applied to the surface of the teeth, while a special light activates the gel. Whitening treatment improves the color of your teeth by multiple shades in one short visit. Afterward, there will be a noticeable difference in the brightness of your smile that lasts for several months. Teeth whitening is an effective procedure, but not everyone is a good candidate to receive treatment. Some patients experience sensitivity from the stronger peroxide gels. Zoom! offers supplemental products that decrease the sensitivity, but for some, a milder whitening solution applied over several visits can prove effective. Staining is most commonly caused by certain foods and drinks. Beverages like coffee, tea, and wine are known for their staining properties, while darkly pigmented foods can discolor your teeth as well. Smoking, poor oral hygiene, and certain medications can also stain your teeth over time. If you want to maintain a white smile, it’s important to reconsider any habits that may influence the appearance of your teeth. Limit the intake of particular foods and quit smoking. Practicing good oral hygiene at home will also ensure that your teeth remain white. Using a whitening toothpaste, flossing daily, and using an oral rinse will help keep your smile bright. Additionally, paying a visit to your dentist regularly will help you maintain optimal oral health. At the Dental Group, our team of dedicated professionals wants patients to achieve an aesthetically appealing smile. If you would like more information about Zoom Whitening, contact our office in Riverdale Park to schedule an appointment!